Too often providers interested in FUE hair transplant struggle to find hands-on, life-like surgical training. While there are many hair transplant courses offered in various workshops, these are often lecture-based and conceptual. Many times, attendees return to their practice from a hair transplant course or workshop lacking the confidence to begin offering FUE hair transplant procedures to their patients. Even workshops featuring “cadavers” can be disappointing in this regard, as the tissue preserved in formalin is far removed from life-like experience. Dr.UGraft takes these considerations into account, which is why we invite those who purchase our devices to come and learn how to use them from the creator, Dr. Sanusi Umar, himself. For those looking for a hands-on hair transplant course the Dr.UGraft hair replacement training program offers ample opportunity. Providers who purchase Dr.UGraft™ devices are invited to Dr. Umar’s clinic in Los Angeles, California, to observe how the tools are used in live FUE hair transplant surgery. They will get the opportunity to shadow Dr. Umar as he extracts head and body hair while common considerations, such as angulation, misalignment, and depth control are apparently minimized. Providers will also get the opportunity to witness first-hand the technical elements of operating the Dr.UGraft™ System, including the integrated fluid irrigation system controlled with foot pedals, as well as the speed setting for the continuous fluid drip and rotary Intelligent Punch (Dr.UPunch i™), among many other things. See the video below for an example of a live surgical demonstration using Dr.UGraft™. With this up-close and personal hair transplant course with Dr.UGraft, providers can bypass much of the beginner’s learning curve and feel more confident in providing an intelligent hair punch service to their client base. For providers keen on leveling up their FUE, either in regular head FUE, body hair transplantation, or afro-textured FUE, Dr.UGraft™ sponsors the biannual Los Angeles Hands-On FUE Hair Transplant Training Workshop. As proponents of hands-on FUE hair restoration training, Dr.UGraft™ sponsors a workshop, held in Los Angeles, dedicated to this very principle. Participants learn the foundations of hair transplant surgery, along with other topics covered by leaders in the field of FUE. Then, attendees get to apply their knowledge on fresh-frozen cadavers (not preserved in formalin) for a life-like surgical experience they can use to build confidence in FUE surgery. 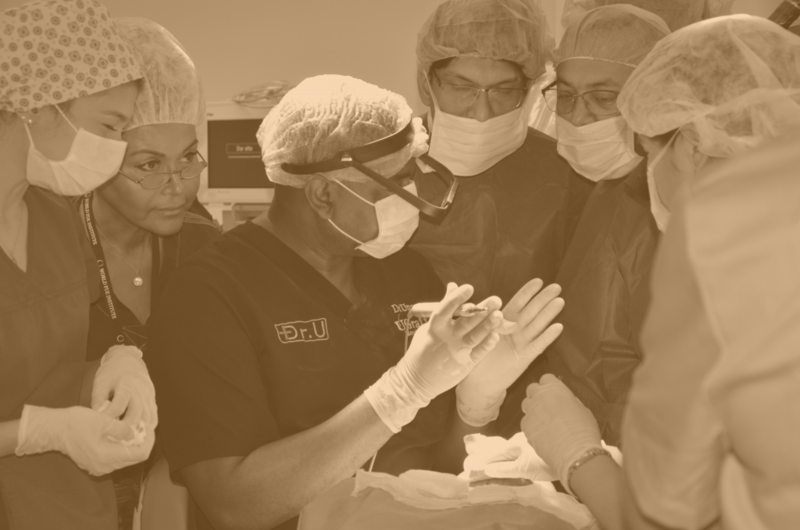 Use the button below to learn more about the Los Angeles Hands-On FUE Hair Transplant Training Workshop, including a full list of faculty, topics, and cadaver stations. Dr.UGraft™ offers a 10% discount on all Dr.UGraft™ devices at this workshop. How do I sign up for hair replacement classes with Dr.UGraft™? If you are interested in shadowing Dr. Umar at his clinic in Los Angeles, California, you can contact us to schedule a visit. If you would like to sign up for hands-on FUE hair replacement training, you can reserve your space in the 2018 Los Angeles Hands-On FUE Hair Transplant Training Workshop here. Are there requirements for a Dr.UGraft™ hair transplant course? Learning from Dr. Umar in his Los Angeles clinic is open to providers who have previously purchased a Dr.UGraft™ device. All providers, from beginners in FUE hair transplant to those with intermediate-advanced skills, are invited to the biannual, two-day workshop in Los Angeles.